Size: approximately 8" X 8 ½"
Materials: One skein of worsted weight cotton in a solid color. The cloth pictured was done in Peaches & Crème in Shrimp. Row 6: (wrong side) k3; (p3, k3) x6. Row 7: k7; (p1, k5) x4; p1; k7. Row 8: k2, p35; k2. Row 9: k3; (p3, k3) x6. Row 10: K3; (p3, k1, p1, k1) x5; p3; k3. Row 11: k7; (p1, k5) x 4; p1; k7. Row 12: k2, p35; k2. Row 13: k3; (p3, k3) x6. Row 14: K3; (p3, k1, p1, k1) x5; p3; k3. Row 15: k7; (p1, k5) x 4; p1; k7. Row 16: k2; p35; k2. Row 17: k3; p3; k27; p3; k3. Row 18: k3; p14; k1; p18; k3. Row 19: k20; p2; k17. Row 20: k2; p14; k1; p1; k1; p18; k2. Row 21: k3; p3; k13; p1; k3; p1; k9; p3; k3. Row 22: k3; p12; k1; p3; k1; p16; k3. Row 23: k19; p1; k4; p1; k14. Row 24: k2; p12; k1; p4; k1; p17; k2. Row 25: k3; p3; k2; p3; k8; p1; k4; p1; k5; p1; k2; p3; k3. Row 26: k3; p5; k2; (p4, k1) x2; p2; k6; p2; k1; p5; k3. Row 27: k8; p1; k8; p2; k5; p1; k3; p1; k1; p1; k8. Row 28: k2; p6; k1; p2; k4; p15; k1; p6; k2. Row 29: k3; p3; k2; p1; k21; p1; k2; p3; k3. Row 30: k3; p5; k1; p8; k3; p9; k1; p6; k3. Row 31: k9; p1; k8; p1; k3; p1; k6; p1; k9. Row 32: k2; p7; (k1, p5) x2; k1; p6; k1; p8; k2. Row 33: k3; p3; k5; p1; k4; p1; k11; p1; k4; p3; k3. Row 34: k3; p7; k1; p11; k1; p3; k1; p9; k3. Row 35: k13; p1; k8; p1; k4; p1; k11. Row 36: k2; p10; k1; p6; k1; p5; k1; p11; k2. Row 37: k3; p3; k7; p1; k11; p1; k7; p3; k3. Row 38: k3; p10; k1; p12; k1; p9; k3. Row 39: k12; p1; k11; p1; k14. Row 40: k2; p12; k1; p11; k1; p10; k2. Row 41: k3; p3; k6; p1; k5; p2; k4; p1; k8; p3; k3. Row 42: k3; p11; k1; p3; k1; p2; k1; p4; k1; p9; k3. Row 43: k12; p1; k4; p1; k2; p1; k3; p1; k14. Row 44: k2; p12; k1; p2; (k1, p4) x2; k1; p9; k2. Row 45: k3; p3; k5; p1; k3; p1; k5; p1; k2; p1; k8; p3; k3. Row 46: k3; p11; k1; p1; k1; p7; k1; p2; k1; p8; k3. Row 47: k11; p3; k9; p2; k14. Row 48: k2; p11; k1; p1; k1; p21; k2. Row 49: k3; p3; k18; p1; k8; p3; k3. Row 50: k3; p33; k3. Row 52: k2; p35; k2. Row 53: k3; (p3, k3) x6. Row 54: k3; (p3, k1, p1, k1) X5; p3; k3. Row 55: k7; (p1, k5) x4; p1; k7. Row 56: k2; p35; k2. Row 57: k3; (p3, k3) x6. Row 58: k3; (p3, k1, p1, k1) X5; p3; k3. Row 59: k7; (p1, k5) x4; p1; k7. Row 60: k2; p35; k2. Row 61: k3; (p3, k3) x6. Row 62: k7; (p1, k5) x4; p1; k7. HI Elaine, I LOVE the Starfish patterns so cute. I got a peek at the pics of bibs/cloths you're doing for the calendar,too. Too cute. Can't wait to buy the calendar. From what I've seen so far, it's going to be the best one yet. Em always buys the calendar for me for my birthday and has since Janet started doing them. It is a cute pattern! I still have days 5 and 6 to knit yet. I hope to finish this weekend, though! The bib is adorable! Yet another super adorable cloth from you! Thank you! 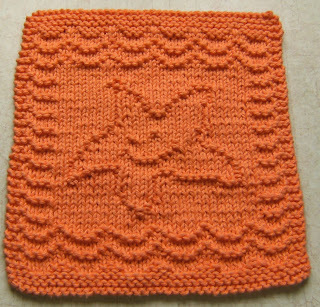 My Chuch is sending Washcloths to our Missionaries in Zambia to give to the people there, and I would love to use this pattern on some that I send. Can I use your pattern? Yes Sammi, by all means go ahead and use it. Thank you for asking. My issue is knitters who make items to sell for their own profit and don't give me credit for the design. I don't think that's nice, especially when the patterns are free. Row 6 when it says 'wrong side'...what exactly does the knitter do? I've googled high and low and am confused. I really want to make this but didn't understand this one thing. Sammie Sue, I'm sorry you didn't understand this. When I say "wrong side", you don't have to do anything. It merely is telling you that this side is the back side or the wrong side of the garment. It just helps to identify which side you're working on. Hope this answers your question! I used the outline of this pattern to make a whale washcloth and I wondered if you would mind if I posted it for free on my blog, with credit to you and a link to your pattern. I printed this, but the print is really tiny. Can u suggest a way to enlarge it?